The force behind this rapid raise in market share appears to be the world wide economic slump. What a netbook is and what it’s designed to do doesn’t seem to be clear to consumers. Changing features and trends are blurring the line between netbooks and notebooks even before the definition of netbook is established. Consumer confusion is increasing as this cannibalization of the slumping laptop market grows. But blurred vision or not, the netbook is the one product bolstering the PC makers who face a market saturated with laptops, reduced IT budgets, and consumers struggling to stay afloat. 1. Eight of the Top 10 Mobile PCs on Amazon are netbooks. 2. Fourteen of of the Top 20 Mobile PCs on Amazon US are netbooks. 3. 48% of the Top 25 Laptops are netbooks (Price Grabber market report). 4. Linux once held the lion’s share (70%) of operating systems shipped on netbooks but returns and complaints of “too complicated” have dropped that figure to 30%. Linux is expected to continue slipping to a 10% share by the end of 2009. 5. One half of Europe’s netbook sales come from wireless carriers that offer the hardware as an incentive to capture wireless data users. It’s theorized that once the global recession is behind us, the return to increased performance will again drive popularity of portables. 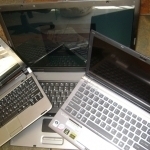 Originally viewed as a second or third addition to ones computing arsenal, today netbooks are viewed by some as an alternative to more expensive appliances. Is it? Can I really spend an average of $300.00 and replace my two-year-old, $899.00 laptop. On the surface it looks like it might be possible. My old laptop has a 1.6 gig Intel Core Duo processor, 2 GB of ram, a 32 GB SSD drive and a 17 inch screen. How bad could a netbook be? Take a look! Yikes, that’s not good! Looks like more than just the normal 200mhz difference in processor speed and available memory. Ohhh that’s right, this is only a single core processor. It’s been a while now since I’ve used a single core processor. What a difference. Now that I’m checking I see a big difference in processor cache also. In fact the memory and video tests didn’t even complete. Let’s bump it up a notch on the netbook side of things and move to the slightly larger 1.6 GHz processor. I would go larger if I could. I hear that there is a 1.8 available now but I can’t find one locally. It’s easy to see that even though the two processors have the same clock speed they’re just not in the same game. 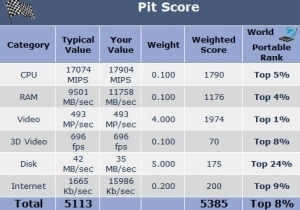 The performance is not comparable and this is against a laptop that is two years old. This shouldn’t really be surprising. It’s not as if Intel designed these processors to compete with today’s latest and greatest. When processing power is what you need, you can’t expect to get it from a netbook. Yes, I know there are slightly faster netbooks but there are also slower netbooks. So long story short it’s easy to see that if you’re hoping to buy one of these inexpensive units as a laptop replacement you’ll be taking a huge performance hit. If tight purse strings is driving force behind the rise of the netbook then it won’t take it long to fall when things improve. 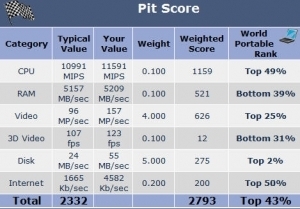 To tell the truth before I tested any of the netbooks I expected them to perform and score much better than they did. I had planned on buying one of the more expensive models available. Like the Dell I tested, some come with a 10″ screen and look more like a laptop replacement, but after seeing the initial tests with the Dell and the Acer One, I had seen enough. What I’m not mentioning is my frustrating reintroduction to bloatware and craplets. We’ve been reporting on it here for over 3 years. Bloatware was disappearing for a while after an avalanche of complaints and articles detailing the alarming amount of time necessary to clean what were supposed to be brand new computers. We even covered the improvement in “first boot” boot times and how that was achieved without manufacturers really reducing the junk. Unfortunately they can’t resist the opportunity to again ram this garbage down our throats and take advantage of the current, but in my opinion, short lived popularity of netbooks. Good alternative for kids? Yes. Fun to play with? Maybe. Long-lived and much-loved portable like laptops? Not hardly. Even now I’m seeing a reduction in the number of choices available compared to what I saw 3 months ago. When I take a look at what’s available in a legitimate notebook with a real keyboard and a screen large enough to display a full web page, I know it’s just a matter of time before netbooks go the way of the 8 track. Remember that blurring line I mentioned in the beginning? Well the blurring isn’t just about changes in netbooks, or changes in the buyers perception. The blurring is also taking place in the weight to performance factor in standard notebooks. Talk about a lot of power in a small form factor. Not only that, but the screen size is still large enough to see without scrolling everything left and right, up and down. The keyboard is close enough to standard size that you can actually type in a normal fashion. This is the way I see things heading. Lightweight, plenty of power, and usability. This actually offers better performance than a lot of desktops I see. So does size matter? You bet it does, but it’s the size of your pocket and your hardware. Research, The Pit Blog consumer confusion, core, difference, economic slump, global recession, Intel, laptop market, memory, screen, wireless data users. permalink. I purchased a Dell netbook from QVC for about $600. I sent it back after a few days it was too expensive for the ram and hard drive it had. I was looking to replace my desk top and/or laptop when I walked into a Staples and saw the Acer netbook with 1GB ram and 160GB hard drive. They were out and had to go to several store to find one for me. I LOVE IT. I took it on a business trip and was able to do everything I did on my big Dell laptop and it fit into my large purse I use when traveling. No need for the rolling carry on bag. I purchased a bag for a DVD player to carry it in and just pulled it out of the purse and placed that in the tray with no need to even open it. When my coworkers saw it they all wanted one, only one had brought her laptop the others said they didn’t want to bother with the big old things. My son a computer programmer loves to play with it when he comes to visit he is just amazed at what it does. I still might replace my desktop but I tote my Netbook around town and on trips. My 10″ Asus EEE has replaced my 15″ laptop for sure. I sold my old laptop and have not regretted it yet. The netbook is perfect for what I want it for, looking at email and the interned while in the living room or bedroom. I don’t miss the hot and heavy laptop at all. I use the power saving mode and no need for a cooler underneath. I like power, I have a huge desktop with 5 hard drives, 8gigs of RAM, Quad Core processor and a 9800GTX video card. It does anything I want. I don’t need all of that when I am putzing around on the internet. The thing I like most is that I can carry my netbook around with me at all times and I can get on line through my cell phone with it. It is what I always wanted. Just for the record, I think there is a place for smaller, lighter computers but I don’t think consumers will have to put up with reduced performance. As I mentioned the “line is blurring” between netbooks and notebooks. I believe a couple of people have mentioned that they are seeing an increase in size and price of netbooks and I agree with that; I’m also seeing a reduction of size, wt, and price of notebooks, thus the blurring line. Have to agree with all the other comments. I’m a journalist who travels a lot. Always have had a robust desktop system for photo editing etc., but for work on the road I first got an early TRS-80, then a NEC MobilePros, the last of the old HPCs to disappear from the market. Bought a couple of used MobilePros but had been looking for something new to replace them when they became harder and harder to find. I was thrilled to see netbooks emerge and finally bought an Asus EeePC 901. It’s perfect for traveling — wireless connection’s a snap, Web pages display in full (even on the 9″ screen, which is crisp), typing is almost as easy as my home system, and running full version of XP allows me to do even more than on my beloved MobilePro. Battery life is a crucial factor here, and your powerful netbooks are dreadful in that department. Only drawback to the EeePc is it’s a little heavier and a little bigger than the MobilePro. My complaint about netbook development is that they seem to be getting bigger and heavier, and more expensive. It’s not the economy — I just don’t want to pay for power I have no use for. 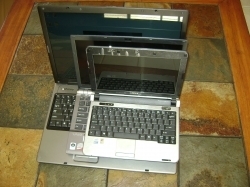 The typical laptop is too expensive compared with a desktop system and too clunky (and battery-hungry) compared with a netbook. I agree with other comments: You’ve really misjudged why people want netbooks. I have been a gadget freak and an early adopter for years. I should probably be in some sort of technology twelve-step program right now instead of writing this. I have thought about a netbook and will probably get one like the new Asus models with discrete, switchable nVidia graphics. 1.) Desktops are generally diverging along 2 lines – gaming and network-connected HD/music servers that mostly enthusiasts either build or buy. 2.) Laptops are the new desktops. Take a new mainstream laptop, add a keyboard, mouse and say a 20″ or larger monitor and you have a system that is likely more powerful than your average 1 or 2 year old desktop and is portable if you detach the peripherals. 3. )High-end laptops are an endangered species. Only specialization will save them. There’s exeptions like multimedia monsters with 17″+ screens, blueRay and full 1080P, but these are the stay-at-home or LAN-party types. No traveler would lug one for long. 4.) PDAs are what you USED to carry if you didn’t want to lug a laptop. They’re dead. Cell phones are the new connected PDA. 5.) Netbooks are what PDAs morphed into after addressing the complants like: can’t type on it, who wants to use a stylus, too limited and incompatable file types. Fix these complaints and you get the Netbook. They are going to stay. They will become more capable, more diverse in terms of price and features and most certainly will not go the way of the 8-track. Of course size matters. Guys like me, who think nothing of lugging 10 pounds of tools,sporting goods,or computer paraphenalia will stick to our big screens and full sized keyboards, the better to fit my hands and play my games. Just because I never liked rap or tatoos or text messaging doesn’t stop them from becoming trends. I pre-ordered an Asus for my wife the first year they game out. She liked it so much that she replaced it with an XP version so she could use business applications and got a 3G connection. Gave the original to the kids. Now she doesn’t travel for business or pleasure without it, she just puts them in her purse. She types at full speed, she connects anywhere, and she’s envied everywhere she goes. I think there is a market for purse-sized personal computing. Didn’t PC pit stop recently do an article on how software very rarely makes use of multiple cores? There fore correct me if I’m wrong, but the fact that a duel (or quad) core can in theory and in test conditions do much better, in real life it makes little difference? I bought an Acer One Aspire. I have a very good Dell Laptop but for many of my trips it just was too bulky and I did not need all that capability. As long as I do not ask too much of the Aspire it does fine. I have been able to lock it up but that can be delt with. I even loaded a pretty hefty flight planning package called Flitesoft on it and it handles it fairly well. I would like to upgrade the processor speed though. So far I haven’t seen one response that agreed with you. I have built several computers and own 7 at present. I purchase the Acer One Aspire and upgraded the memory to 1.5 Gigs. Though the upgrade was a little tricky. You have to actually take the machine apart to insert the 1 gig chip it was worth it. The process took me about 30 minute with the guidance from a great Utube video. At 2 pounds it is exactly what I was looking for in a netbook. My Dell xps laptop is hardly used anymore. 90% of what I need a computer for is accomplished fine on the acer netbook. They will be around for many years to come. I snagged an Acer One from CC before they went belly up for only $250. WOW, what a deal! 1.6Ghz CPU, 1G RAM, 160G HD, and the icing on the cake… Windows XP!!! The size, battery life, boot time, all lived up to the reviews and all blow away any laptop out there. Your review really is worthless. Did you know that the Sony laptop you rave about costs $1500 via Pricegrabber? Do you know what I can buy for $1500?… 6 Netbooks!! Another huge strke against any laptop out there right now is that they all come with Windows Vista, so they need all that horsepower to do the normal everyday things like typing a flame to a worthless review. I hooked up my Acer One to my 32″ HDTV and watch DVD’s from the Huge HD. My daughter plays SIMS2 with beutiful graphics and much faster than my old 2GHz Sony Desktop. Did you know the Acer One is cheaper than the Apple iPod Touch my wife got me for my Bday, and it is much more fun to have on a long plane trip! Oh well, you go ahead and keep your head buried in your PC performance tests, meanwhile I will be enjoying my Acer One!!! I purchased a Fujitsu 810 Lifebook last June for a cruise to Alaska. I wanted something lighter and more compact than my Dell 1501. I looked at the Acer and Asus 8 & 10 inch Netbooks, but didn’t want to learn Linux and fthe hunting for drivers nor did I want to purchase and install XP on it. Then I discovered the Fujitsu 810 with a 5.6 inch monitor, 800mhz processor, 30Gb HD, 1GB Ram, weighing in at 1.56lbs, I get about 4+ hours on a battery charge, MS Vista OS and all the software I would ever need. I use a Verizon Wireless Internet modem USB720. It has been a perfect fit for travel and as a personal internet radio at work. My back and shoulder loves the lower 1.56lbs. Contrary to what everyone would think, it is very responsive, but I have been a Vista fan from day one, and I even edit home movies and upland to Youtube from my Fujitsu. It cost twice as much as most the Netbooks last year on now, but it has a ton more features ie: it’s also has a Tablet node with hand writing software, finger print ID and a very cute pair of headlights for night time work on a plane or where ever. It has and does everything I want and I feel it will for some years to come. Now, I use it more hours per day and night than either of my full size Dell Laptops. One thing this article and most comments failed to mention is battery life. My 15.4″ Dell laptop doesn’t even have enough juice to make it through watching a DVD on the battery alone so what good is that? Many of these netbooks get 3-4 hours on one charge and some (Asus eeePC 1000HE) get more like 6-7 they claim. I will definately be purchasing one of these netbooks in a few months and honestly I can’t wait to see what is out there for options. There are new processors being released, maybe 2G of ram will be standard and hopefully HD resolution as well. *groans* This is the worst review yet, and I can’t keep quiet about this one. Its too unfairly slanted. 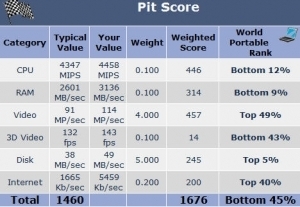 You’re comparing a single-core netbook [yay!] to a dual-core notebook [complicated], and for the record, a netbook is a NETbook, not a LAPtop! Its designed for internetting, notetaking, word processing, chatting, any simple task you can name. Its NOT for gaming nor power-use. Your article even makes you sound like a power-nut. Not everyone wants power and gusto. They want lightweight and functional. I’m saving up to get a netbook, since I do more simple tasks than anything else and I would prefer the simplicity of a one-core and be able to choose an OS and/or just dual-boot as usual. I’m not going to buy a cellphone for the purpose because a cellphone is too small and too different, and I’d need even worse magnification and accessibility than I already do. And I agree with everybody else, finally. Your tests and comparisons are fast-becoming worthless. You assume everybody’s got the top-notch of everything and your “opinions” are written in a tone of absolutism. And by the way, your Overdrive result pics were too small and blurry for me to read. I had to blow up the screen to the point I had to scroll up and down, left and right, to read your article. If I had used a screen-reader, your pics wouldn’t be readable, right? I miss the way the PC Pitstop newsletters used to be. Easier to read, more accessible and had tables instead of pics for reference, less trash was written, a lot less ads, less to no comparisons, and the tone didn’t sound like the readers were idiots. Not to mention the writers sounded more balanced and impartial. Am I going to see this newsletter go the way of the 8-Track? For me, probably, if I end up unsubscribing! For others, who knows. After two years of my lugging around my extremely capable Sony Viao and my wife her Thinkpad, we decided it was time to lighten our loads and purchased a pair of $450 Samsung 10″ netbooks with 160 gb drives. For $20 each, I upgraded the RAM to 2GB and we were off to Europe for a month. These things work great and weigh about what the huge power bricks alone did on the laptops. We ran our business and did our banking on them while traveling, offloaded hundreds of photos into Photoshop Organizer and did some light editing, kept up with the news back home, and used them to read ebooks so we didn’t have to travel with a pile of paperbacks. One of the biggest pluses over a regular laptop is the 6-7 hour battery life. I will always have a powerful desktop for serious photo work and games, but the Samsung has all I need for 95% of what I do. An guess what I’m typing this and all my emails on now while my Vaio languishes at my feet? The keyboard is quite adequate for touch-typing and our fingers soon adjusted to the slightly smaller (94%) keyboards. Many, many people were interested in getting a netbook after seeing ours in use. I was at IBM when we introduced the original PC and there is no doubt in my mind that the netbook phenonomenom is here to stay. I don’t think that the popularity of Netbooks will be short lived. In fact as technologies get better and processors get faster their popularity will only increase. I personally am the proud owner of an EEEPC 900A which is great for what I need. It weighs less than a kilogram and with more than 3 hours battery it lasts for as long as I need. I must admit that storage space was a problem under Windows XP (8GB SSD) but now that I have switched to EEEbuntu that isn’t a problem. I mostly use it for listening to music, surfing the internet and the occaisinal word processing. If I want to play 3D games or other resource hungry programs I use my desktop. Its great to hear all the other people talking about how great their Netbooks really are. Long Live The Netbook! I agree that this comparison tells us nothing we didn’t know already. It is meaningless really as it is all about portability and ease of use, on the move. My old Dell notebook weighs 3.7kgs and is not allowed out anymore much to my relief. My new MSI Wind U100 gets all the trips and it does everything I need and more. One of the best buys I ever made. Netbooks have a future and will just get better. These are NOT a gimmick as implied in the article. 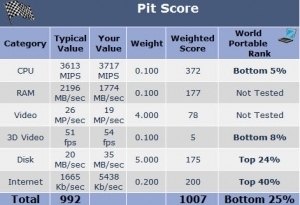 Why do you even waste your time trying to compare benchmark tests between NetBook and NoteBooks. They are two different machines, and the NetBook was not meant to be a Laptop replacement. I travel a lot, overseas and locally, and up until my last trip when I took my new Asus Eee NetBook, I had to lug that nice fast laptop around. It was a real PITA. Try traveling with a NetBook and you will see the difference. That little baby does everything I want it to do and more on trips. The first thing I did when I got it home was to load Windows 7 Ultimate on it, and it performs great. Sure it may take a few extra seconds to boot up. Big deal! I have bit locker on it so if it is stolen, my data is protected, and at the price I wouldn’t be out that much. Get real with your dire predictions of gloom and all, and running these fake tests. They don’t prove diddly squat. Will NetBooks go the way of the 8 track? I hardly doubt it. There is a place in the market for both NetBooks and the tradition Laptops (though they are not really “laptops”. When I saw my first ad for a netbook I too said what good are these. Limited memory, slow processor’s, no cd or dvd drives of any type. Then on my next trip to the coffee house, what do I see, but a table of three with minature netbooks in front of them. It seems to me after more research on these divices It is unfair to compare them to regular Laptops. The netbook seems idealy suited to those whom want to stay in touch via the internet, with photo’s,video’s,emails and the like. These are even a bigger plus for college students, small,light,why, one of these with a 120 gig HD you can put 4 yrs of studies on one of these. Then you could put it in your library shelf for referance. So I think you have missed the point, they have a place in the market and I think they fill it very nicley. Let us not be to critical of what we don’t fully understand. I got an ACER Aspire one about a month ago and love it. My ‘normal’ laptop has now largely been consigned to being a 2nd desktop at home. Of course a netbook is not intended ti replace a ‘power user’ laptop. But it can do most things, most people need to do when out and about. As well as eMail and net browsing I have taken to download recorded video from TV sites (in my case BBC iPlayer) and also use it to catch up on the TV I am not watching when on the train, etc. The fact that it is light, can be thrown in a bag at a moments notice (I have a SSD drive variant) and sufficient power and connectivity to do most every thing I want makes it ideal. Like most people here don’t consider one of these as a ‘laptop replacement’ (though for a lot of people it could be) but more a different tool that, generally, does a different job very well. I am writing this (touch typing) on my Lenovo S10 while traveling. I love this little guy. It easily replaces my 3-year old Sony and weighs about half as much. I don’t play games or do any complex graphics (I do manipulate photos). I tried the 8.9 inch screen netbooks and decided they would not allow me to touch type. This one has a ten inch screen and the keyboard is about 80% the size of my Sony. I did not expect the netbook to be as capable (of doing most of what I never do anyway) as my desktop or my Sony. Low cost, light weight, and *enough* capability–that’s what sold me. I bought an Asus Eee PC with Atom processor, 1GB RAM, 160 GB HDD for my girlfriend to replace here Dell laptop … she loves it! The netbooks may not be for everyone, but for someone who doesn’t need to watch a large screen, or play games, they’re perfect. If cuteness were to ever count they win hands down … my HP laptop looks enormous and clumsy next to her netbook. I’m as much of a performance geek as anyone, but I would not replace my Asus eeePC 8G for what I use it for. I can carry it anywhere I want and even bringing the charger with me it is less than 2.5 lbs. Just because I can carry a 10 lb laptop doesn’t mean I want to. I’m not doing heavy duty writing on it, but even at my size of 6’3″ the keys are big enough to type at reasonable speed. It works especially well for showing my children’s church class video clips from the web or using Google Earth while plugged into a projector. BTW, I let my kids (about 25 of them) take turns helping me by running the computer during class. My eeePC is running the Xandros Linux it came with and not one of the kids have had any problem figuring it out. Like the others here, I agree, you are missing the point. I use my HP netbook to surf the web and check e-mail. More than enough power for that. Most importantly, it is portable! My other laptop weighs nearly 8lbs. Taking that to the airport and on a trip feels like a 100 lbs by the end of the trip. I love it for what it is. A “portable” tool I can actually use while traveling! I fell in love with the original ASUS EEEPC701 and marvelled at how delightfully simple it was to use. The introduction to Linux was simple, painless and I’m a convert for certain situations/uses. The lack of hard drive space was addressed by adding a 16GB HCSD card. Everything worked superbly. But I needed Windoz to run a particular accounting packaged for my business, so I “upgraded” to an ASUS EEEPC900HD Atom 1.6gb with 160GB HDD. This little beauty is nothing short of amazing. I find it fast or seems fast compared to my desktop models – certainly there is no obvious slow down and this is with antivirus/spyware protection running. Wireless internet works a treat, speed determined by the carrier. Connected to a network internet speed is amazing. I use it to back up my business records to take with me, edit video and photgraphs, log on for e-mail, surf the internet and do work on. The long battery life, small footprint, makes this a very useable tool, allowing me to work where and when I choose including places I would not consider using my conventional laptop. It goes with me everywhere. Netbooks are a great development in the world of computing. Obviously some are better than others for different purposes – ‘A step back to go forward? This isn’t like comparing apples and oranges; it’s like comparing apples and sewing machines. A ladle holds alot more than a spoon, but I don’t use one to eat my soup. I honestly would have to think for a while to remember the last time I did something which I could not do easily on a netbook. I like my mac book pro, but it’s a luxury, an extravagance, not a necessity. Why was the comparison done to a dual core laptop. This is an inherent starting bias in the article. It makes the conclusions easier, but much less valuable. What were the numbers for a single core machine – the majority of the laptops out there? I’ve been considering these for quite a while. I have an older Dell laptop I got refurbished via their Ebay shop where they dump returned leased machines, and it’s fine for heavy-duty on-the-road computing when I need it for business. But for a lot of trips, all I really want to do is surf weather and travel things and connect with my email. I sort of view these books as the modern equivalent of the old Trash-80 toys we dinosaurs used to travel with at the dawn of online time. I think reading this article and the notes so far tells me this is all about expectations and needs, not some abstract measurement against Deep Thought. If you only plan on doing a little, then what’s wrong with a little computer? Now somebody tell me WHICH one they like best, please, for the needs stated above? Thanks! i ALMOST BOUGHT A NETBOOK BUT STAPLES WAS OUT OF THEM EVERY TIME I WENT IN TO GET IT. THEN I PAID JUST $449 FOR A COMPAQ WITH A 17″ SCREEN AND A 10 KEY NUMERIC PAD WHICH I NEED, BUT I WISH I HAD THE NETBOOK. THIS THING WEIGHS 6.5 POUNDS AND I DON’T WANT TO CARRY IT ANYWHERE. I THINK THE REASON THERE HAS BEEN A REDUCTION IN THE ATTENTION PAID THE NETBOOKS BY THE MANUFACTURERS IS THEY DON’T MAKE ENOUGH MONEY ON THEM. JUST AS THE CAR MANUFACTURERS WOULDN’T SUPPLY COMPACT CARS. THERE’S TOO MUCH PROFIT IN THE LARGER ONES. i have an acer one and just love it. as an airlne pilot on the road all the time it does everything i need. check schedule, email, banking, newsreading. at 300 bucks its disposible. I bought two Acer Atoms a few months ago to run two neighborhood radio stations that I operate. They replaced towers that were aging and breaking down. Regardless of what the benchmarks say, these little fellows do just fine. They have plenty of horsepower to run the automation software, and the hard drive is more than adequate. Not to mention the space they save and the fact that they give wireless access to my home network. Hate to break it to you… there *IS* a place for a low end computer in this world, and the netbooks fill that niche very nicely. No, I’m not going to do extreme gaming on these guys, but they handle MP3 audio 24/7 like little pros! Oh yes… money was no object in my purchase. The machines looked as though they would do the job, and they did. Why should I have spent more? I love my netbook, a Lenovo s10e. True, my Toshiba Satellite (4019 score) can run cirlces around it (1697 score), but at $300 it is an outstanding travel companion. I’m a professional photographer, and the netbook is great for my on-site work – I run PhotoShop Lightroom instead of full PhotoShop and it drops right into my camera bag without the need for a special laptop compartment. I think you’ve completely missed the boat here – heck, I almost use my PHONE for more “computer” stuff than my laptop. Netbooks will only get faster and better. Well, I just bought the Acer 9″ to take on a weeklong trip cross country. It performed flawlessly and I was able to drop it into my purse. I accessed my server at home, my bank account, checked email and accessed a server where I do a lot of programming for my telecommunications business. I downloaded pictures, downloaded a free softphone called X-lite, plugged in my headset and sat in the airport, talking over the internet with my IP enabled number that I had set up before I left. I surfed the net for fun and for business, and in my conference, I sat and took notes easily on MS One Note. It had all the power I needed for these things. I also bought a few little add-on devices just for fun: a USB mouse, a USB numberic keypad (for those days that I accessed my accounting package and needed to work on numbers). The mouse also came with a little USB hub, which I really haven’t needed, because the Netbook comes with 3 ports. I did go ahead and purchase a slimLine LG DVDR/CD player to load all my software that wasn’t downloadable. It was $89 at Best Buy. Oh…and I also downloaded a package called Total Recorder and with my headset, I recorded audio files for a Music On Hold production, and emailed the MP3 files back to my home office for post production. I have 160 GB HD. I see all your test results, but I’m wondering…what more could I ask for when traveling? Forget the model number but I had one of the little E’s. It was OK for surfing but was just too small for me. I’m 6’2″, 250lbs. I was always hitting the wrong keys. I gave it to the kids. It kind of peeves me to see everyone doing these pointless little tests. Netbooks where not designed to be notebook, desktop, or replacements for any other type of system. They where designed as lightweight, low power, portable computing devices. I bought an ASUS EEE 900ha for about $300.00 bucks. And sadly it has become more useful then my $2000.00 dual core machine. I can audit networks (Wired and wireless) I can use its SATA hard drive adapter to connect to desktop hard drives to perform data recovery and computer forensics. On top of those nice features it also boots from the SD, USB, Ethernet, and hard drive. So I can carry several OS’s with me. And I also read another article the other day where M$ was bragging about Windows now running on 96% of netbooks. Only because people have gotten lazy and can’t learn to adapt in any way to new software. I bought an Acer netbook not because it was cheaper, but because it is small. I travel a lot overseas and a standard notebook is bigger than I want to carry so it has always been left home. My netbook runs the programs I need — I can track my portfolio, access my bank and brokerage accounts, dictate with Dragon Naturally Speaking, load dictation files, copy photos from my camera to the Acer hard drive. And if it gets swiped or lost, it only cost me $300. That is cheaper than a 60GB drive I bought two years ago to download photos to. I have a MSI Wind and it does everything I ask. Last week I was on vacation in San Francisco. I was able to log on the the hotel Wi-Fi, check my work email, surf, and during the four hour flight back mangaged to sort nearly a thousand photographs my wife and I took during the week. The Wind fit nicely on the airplane tray table. The person in the next seat had a full size laptop, which she had to use from her lap. She seemed very uncomfortable. Are there any things I would like? Sure. A better track pad (but I hate track pads anyway) and a lightweight portable usb DVDR/CD player. On-board would be better, but I see Amazon has a slick looking external for about a hundred bucks.